City streets allow residents and visitors safe and easy routes of travel around the City. Streets are maintained throughout the year by the Public Works Department. To report a street light that is out or blinking, call City Hall, 763-425-2624, ext. 101, or email with the exact location of the problem light, and include a house/street address and the nearest intersection. Please include whether the street light is out or blinking. If you choose, you may also contact Xcel Energy's Outdoor Lighting Outages at 1-800-960-6235 directly or at their website to Report an Outdoor Lighting Outage online. Project Newsletter #1 was sent to residents involved in the projects with their Special Assessment notices. Project Newsletter #2 was mailed by WSB to all affected property owners. Project Newsletter #3 was sent by WSB to affected property owners. Project Newsletter #4 was sent by WSB to affected property owners. 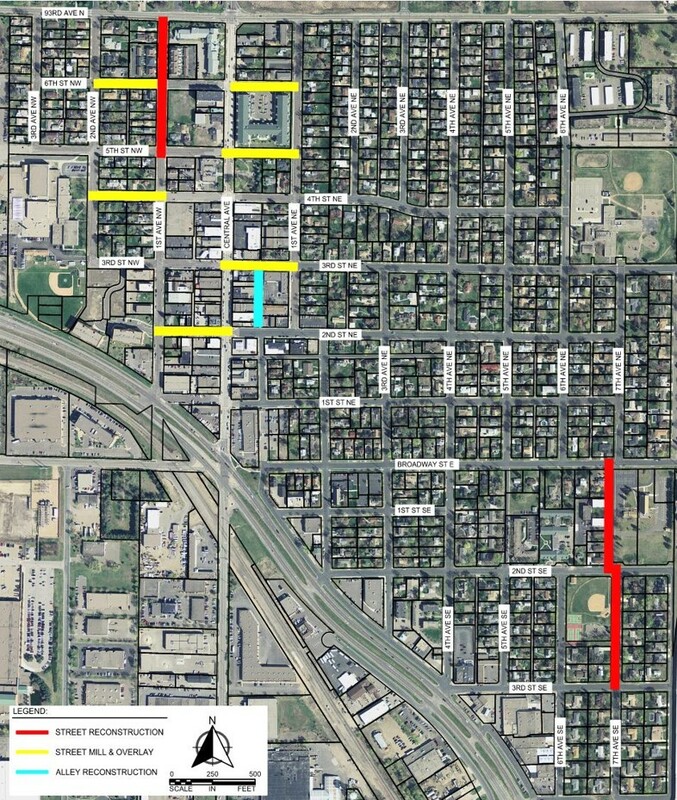 The alleys planned for reconstruction are located in between 2nd and 3rd Avenue NE and the alley between 5th and 6th Avenue NE from 4th Street NE to 93rd Avenue NE. • Project is to be funded with City funding and special assessments in accordance with the City’s special assessment policy for alley reconstruction. The streets planned for reconstruction include portions of 4th Street NE, 4th Avenue NE, and 6th Avenue NE. Do you want more future street project information? A map showing proposed future plans can be viewed here. Stay tuned for construction bulletins and updates. Osseo's Special Assessment Policy sets out how the costs of improvements will be shared between the City and property owners. The land must have received Special Benefit from the improvement. The amount of the assessment must not exceed the Special Benefit. The assessment must be uniform in relation to the same class of property within the assessment area. Once the criteria are met, the Policy describes how costs are allocated. You can review the policy here. The City of Osseo's Special Assessment Policy was initially adopted July 25, 2011, and was revised January 9, 2017 and March 11, 2019. Safety and efficiency of our street network is a key concern in Osseo. Streets, sidewalks, boulevards, and other right-of-way components affect quality of life. In light of these factors, the City adopted a Complete Streets Policy in August of 2017. You can review the policy here. one specific design for all future street projects. On September 12, 2016, the City Council approved a Sidewalk Inspection & Maintenance Policy. The policy provides standard specifications for sidewalk construction in residential areas. It also sets a timeline for regularly inspecting and repairing residential sidewalks. In periods between inspections, Public Works staff are allowed to make patches with asphalt or other durable materials. Residents who want to do work on their own sidewalks must apply for a Sidewalk Permit for work in the City Right of Way. The City completed repairs during the summer of the 2017. Due to lower-that-expected costs, the City has been able to fund the entire project with federal Community Development Block Grant funds and an additional contribution from the State of Minnesota’s Small Cities Assistance Program. Under these special circumstances, there will be no property owner contribution required for the 2017 Sidewalk Repairs. If you have questions about the city’s sidewalk repair program, please visit the city's blog post about sidewalks.